Docks are very busy places and represent a significant risk for an accident or incident, particularly when during busy seasons. There are some things you can do to reduce this risk and demonstrate the intention of creating a safe work environment for the employees that operate on or around your docks. Institute a service program – Having a professional source examine and service your docks, levelers and doors on a regular basis is the first line of defense of catching potential problems before they occur. A thorough inspection of your trailer restraint system (chocks, bumpers, locks etc…) are all in good working condition and do not need replacing. One of the major safety issues around a dock is trailer creep. Trailer creep occurs when the constant in and out of forklifts causes the trailer to “creep” away from the dock, creating a situation where the forklift could drop between the trailer and dock. Training – Be sure that every one of your forklift operators knows your process of ensuring a trailer is safely locked down, brakes applied, wheel chocks or locks in position before they enter the forklift. In addition, be sure that anyone that might come into the general dock area at any time knows the hazards of doing so. Accidents can occur when an unknowing pedestrian walks into a dock situation and does not understand what he or she needs to be aware of. Assess each load and or unloading situation – When loads, equipment and employees vary it is important to be sure that not only the trailer is locked and or chocked, but that it is also safe to unload before you do so. Unless the forklift operator is very familiar with the equipment, have them park their lift truck and inspect the trailer floor to be sure it can handle the forklift and load safely. 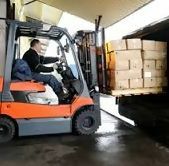 Have the operator also verify that the pallets and load are properly secured and that the weight can be handled by the lift truck. Be sure they meet the weight capacity of your leveler or bridge. Use floor markings, safety equipment and keep the area clean - Clearly marked hazards and safe areas are a good way to ensure pedestrians, truck drivers and forklift operators stay within the safe areas of your dock. Be sure that the floor, leveler pits, and other areas around your dock are free of debris, loose pallets and the like. And use pedestrian warning indicators and/or mirrors to be sure to minimize blind spots. It is very easy for an unknowing pedestrian to step into the path of a lift truck exiting a trailer. Partnering with a professional material handling company gives you insight from industry professionals whose goal is to help you create a safe working environment for anyone that operates in or around your docks. Toyota Forklifts of Atlanta is a partner that works with you to optimize safety AND productivity in and around your docks, and all areas of your facility.